We live in a country that is predominantly Catholic. So we have gone to Mass several times, usually for a specific reason. For instance, we have attended for a First Communion and to come alongside those who have lost a loved one. Since I am a not a practicing Catholic I mostly observe. We also meet regularly with 3 couples (who are Catholic) to study the Bible. I am listening, observing and learning. Because I want to understand and know what they believe, and why they do certain things at Mass, I am reading a book to help that learning process. It is in English, which makes it easier for me to follow and understand. Jesus is also our constant point of reference and we too believe in a God who delights in bringing humans into fulness of life. Jesus is the very thing we have in common. In our Bible studies we always come full circle back to Jesus. Do we always agree on theology or ideology? No. But we are working out our faith with fear and trembling. Are you? At times I find myself, during a mass, or in life-on-life experiences, questioning things. But I have come, maybe through the conviction of the Holy Spirit, to realize that when I question what they are doing, or how they are living, I must also look at my own faith group. Do we, do I, live like a follower of Christ? Is my life a living testimony? Are my religious services ritualistic? Am I engaged in worship at church? Do I listen with an open and receptive heart? Do I attend church as an obligation to fulfill? 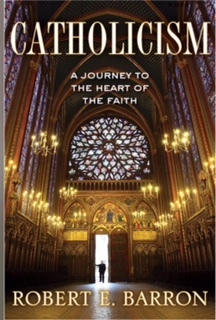 As I engage with my Catholic friends, as I journey together with them in faith, I am looking at faith more closely. I am being stretched and challenged to be less concerned about the label we/they wear and more about how we live. How did the man, Jesus Christ, change me? How did He change you?